Remember those "I'm a Mac, I'm a PC" ads from the mid-00s? Well, once again Apple and Microsoft are caught up in another public spate of bickering through advertisements. This time, it's the iPad versus Surface Go debate. Is there a true alternative to the iPad in 2018? In a new advert for its Surface Go 2-in1 device, Microsoft takes a shot at Apple's iPad, saying it's not a real computer. “Grandma don’t go out and buy an iPad,” the girl in the video sings. “It was fine when I was six but now I’m 10. My dreams are big so I need a real computer to do all of the amazing things I know I can.” The video ends with the tagline: Big dreams need a real computer, like the Surface Go. Whilst Microsoft is busy trying to convince consumers that its Surface Go is a 'real computer', Apple is asking the question: what even is a computer in 2018? Apple ran ads for its iPad Pro with iOS 11 earlier this year under the tagline: What's a computer? This is not, of course, the first time to two companies have fired shots at each other directly. You may remember, as I do, the TV ads from the mid-00s that featured the famous comedy duo David Mitchell and Robert Webb (at least in the UK! ), one as the stuffy, dull, office PC, and the other as the cool, hip, coffee house Mac. Apple is really trying to sell the iPad as a replacement for a traditional laptop or desktop computer, but can it really deliver on its promise of being the only device you'll need for both work and play? 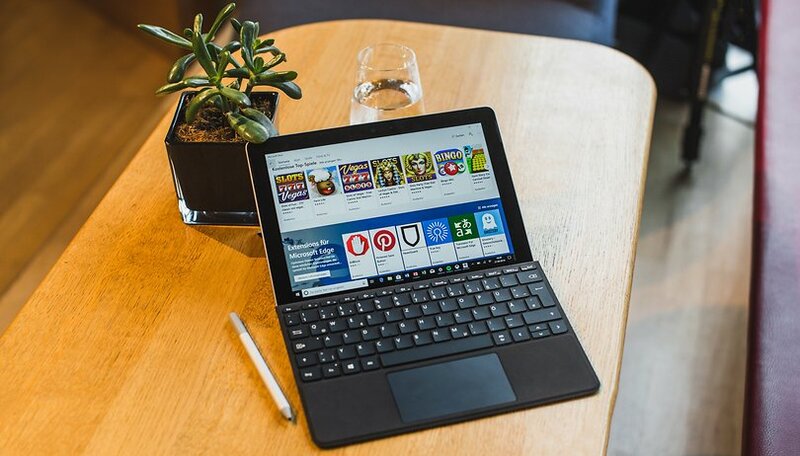 Is the Surface Go a 'real' computer? Wherever you fall on this debate, it's nice to see the pair go at it again, at least for our own amusement. What do you think of the new Microsoft ad? Would you rather buy an iPad or a Surface Go? Have your say in the comments below. I don't want either of them. Theyre both locked down devices trying to keep you in their app store for 30% for doing nothing. The iPad can do everything a student needs, and most things that general clerical staff need at work. For people who don't really use their computer for much of anything but web surfing and email, it can do that too but so can their phone. The surface is more. I haven't figured out how to code a database on an iPad as easily as I can on the Surface Pro I use for work. None of my cartography software or autocad runs on an iPad. The only version of photoshop that works on the iPad is a junky app with 5% of the functionality, vs the full software on my work Surface. For cheap people, gimp doesn't run on an iPad at all. Windows, Linux, and Android have no equivalent to SquareUP the iPad's point of sale store that you find everywhere these days. And no answer to the amazing power of iBooks Author even after 8 years, which is sad. But those are very niche whereas the surface's advantages are core functions.